There were those, observing the very individual suspension of the rear wheels, who were more than skeptical of its capabilities, but only a short run was enough to convince most of the doubters that here was a car with exceptional qualities. The Aurelia featured a groundbreaking independent rear suspension system for the new car. 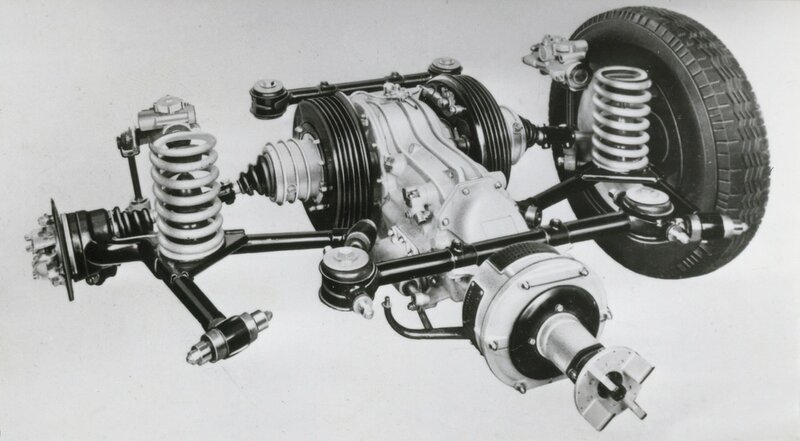 Lancia had long featured independent front suspension, a staple of the marque since the Lambda, and had introduced an independent rear suspension in the prewar Aprilia, but its design was complicated, a combination of trailing arms, torsion bars, and a transverse leaf spring with tension cables. For the Aurelia, this was completely reconsidered, with a much simpler design of triangulated semi-trailing arms. Lancia explained this new suspension as "Finally, again for the first time, Lancia [has] adopted an entirely new and patented system of their own invention for the independent suspension of rear wheels, with inclined diverging arms and coil springs." At that time, work on independent rear suspensions in the automotive industry was limited, if considered at all. Other companies (such as Volkswagen, Mercedes-Benz, and Tatra) were exploring the use of either trailing arm, swing axle, or De Dion–type designs. Semi-trailing arms were explored in the 1940s only by Lagonda and Lancia; the Lagonda solution was awkward and short-lived. 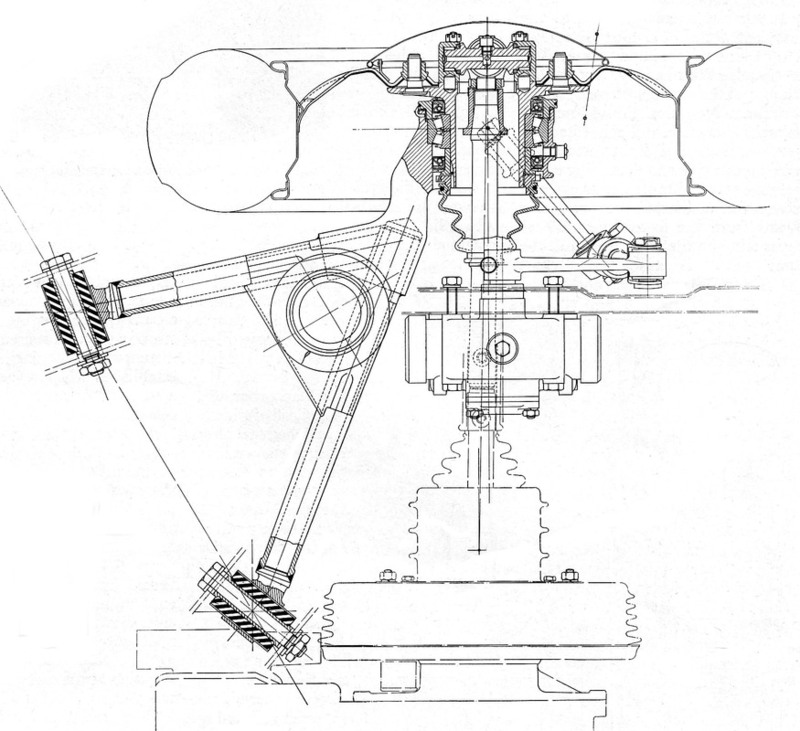 The Lancia solution was successful, using triangulated arms to combine benefits of a trailing arm with those of a swing axle. It was a design that became widely accepted years later, as the basis for suspension designs by BMW and others in the 1960s and later. Lancia’s patent submittal in September 1947 showed swinging arms cleverly pivoted 60 degrees from the longitudinal axis of the car (or 30 degrees from the geometry more common for a trailing link), to combine the advantages of both trailing and swinging arms. In the Aurelia installation, the driveshafts to the wheels extended through the hubs, with the outer universal joints located just outside the wheel mounting, cleverly hidden under a domed hubcap to maximize the length of the axle shaft and minimize working angles. The mounting of the inner pot joints was carefully detailed to spread their loads broadly to the transaxle casing, providing additional rigidity at this key location. The more one looked, the more elegant solutions were found. The significant breakthrough of the rear suspension design was recognized by the leading press at the time. Manufacturers were studying the use of IRS, and Lancia was seen as a leader in the field. The semi-trailing arm was understandable, but Lancia’s clever use of offset bushings remained difficult to assess. It only took someone driving the car to realize how well it worked.